It has been raining the last couple of weekends so we haven't done much work. The wiring is finished and the paneling is going back up. The tile glue is holding well. Much harder to get the bubbles out though, and you really need to let it set up a couple of days before installing the panels. We also bought our patio cushions at Target. They currently have a 50% off sale. If you look at the back wall you can see where I installed a couple of scraps of plywood to cover the wiring. It also gave me a place to install the carrage lights. (Lowe's, $8.00 each) They are hooked to a dimmer switch for a more romantic mood. As romantic as you can get with two kids sleeping nearby. Anyway, that is it for today. 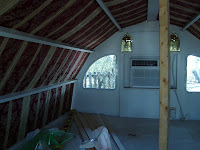 Have to finish covering the bunk with plywood. Bet you are wondering how I'm going to get the caravan out from under the carport. I'll save that for later. We installed the air conditioner over the weekend. Bought it from Sam's for $86. Wal-Mart has them too for $96. Had to widen the window opening about 1/2" to get it in. A piece of 3/4 plywood left over from the benches is on top along with some left over 2x2. The 3/4 plywood fits into the AC's upper mounting bracket. On the bottom I used 3/4 plywood and 2x2s. There is also a 1x4 window sill. The air conditioner's lower mounting brackets are screwed into the sill. I still need to caulk around the edges of the air conditioner to make a water-tight seal. Two brass carriage lights will go over the top of the air conditioner. Some left over plywood will go between the king posts over and under the AC to cover the wiring of the lights and outlet for the AC. All the wiring is finished except for the 15 amp male exterior plug, the 15 amp ground fault plug, and the lights. The male plug will hook into the ground fault plug, which will act as a 15 amp circuit breaker. All other plugs are hooked in series to the ground fault plug ending with the dimmer switch for the lights. That way all the plugs and light switch are protected by the ground fault plug. The light switch gave me a fit for a few minutes. After a quick check on the Internet, I figured out how to wire it. The white wires are hooked together as are the green ground wires. The black wire hooks to the hot black wire from the previous plug and the red wire hooks to the black wire going to the lights. The yellow wire isn't used. On the back of the AC you will notice some vented metal panels. They did not come with the AC. Nothing was covering the coils. Not the best of situations for traveling down the highway. The panels are actually vents bought from Lowe's for a couple of bucks. They measure about 17x8" and 17x4" and match the color of the AC. The two of them cover the coils of the AC. 4 screws were removed from the back of the AC cover, then the vents are slid under the air conditioner cover against the coils and attached with the screws. 4 small holes were drilled in the vents to match the original holes for the AC screws. DO NOT TRY TO DRILL NEW HOLES IN THE AC COVER TO ATTACH THE VENTS ON THE OUTSIDE OF THE COVER. You will damage the air conditioner. My wife Lisa had the idea to mount them under the cover after I learned the hard way not to drill new holes to attach the vents to the outside of the cover. This is the second AC I've installed in the caravan. 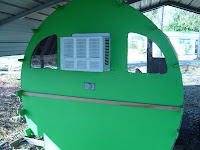 The vents should protect the AC from debris and insects while traveling while providing enough ventilation so the AC works properly. Anyway, it is in. I'll finish the wiring next weekend and try to get a better picture of the vents. The PVC panels have been removed to be recovered using tile floor cement. The other glue stuck in some places but started coming loose at the edges exposing the seams. The new glue should fix the problem.